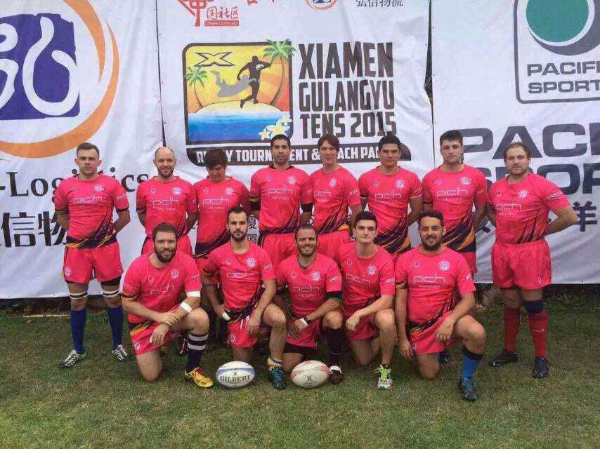 By 2013 Shenzhen’s only full contact Rugby team was in danger of dying out. The excitement and popularity the Dragons had built in their first few years representing Shenzhen in matches and tournaments across the country was slowly withering away. If not for the ladies team, which was still attracting more women than men to the sport, the club may have ended. President Wynand Bezuidenhout, aided by coaches, Dylan Navra and Julien Morlet, and a new committee comprised of Andrew Whitestone, Mary Zhou, Sarah Wu, Deiby Mendez, Emma Russell and Jonna Heykoop, put the club back on track. Just in time for the 2013-2014 season. The Lady Dragons are now one of the largest playing squads in Women’s rugby in China and the men’s team have lined up some impressive victories; winning the Guangdong Cup against Guangzhou, and The South China Cup by finishing top of a league containing Guangzhou, Xiamen and Fuzhou. Now all eyes are on them as they stand off on the pitch against the Guangzhou Rams for the All-China Cup Championship this Saturday May 16th, the biggest game in the club’s history. “It’s been a tough road and I’m really proud of our team for how they’ve managed to turn things around,” says President Wynand Bezuidenhout (Pictured bottom right). “They’ve worked hard; not only by training twice a week but also in their volunteer work in the community.” The Dragons have started projects with local schools and clubs; helping students at Green Oasis school, running coaching sessions, and training young rugby players every Sunday at Shenzhen Bay Stadium free-of-charge. The Dragons, now over 40 strong, meet twice a week for training; with touch rugby and fitness on Tuesdays in Chegongmiao, and contact and skills on Thursdays in Hongshuwan. The club boasts that they’re much more than just a rugby team. I’ve seen for myself that they are in fact, very social off the pitch as well; welcoming players (experienced or beginners), fans of rugby or not, and those who enjoy relaxing and blowing off some steam. From unknown to potential national champions in just a few short years, the Shenzhen Dragons epitomize what Shenzhen is all about. Hard work, dedication, and following their dreams have propelled this group of men and women into the national spotlight. Come watch the Dragons this Saturday May 16th from 10am to 1pm at Beijing University Stadium inside Shenzhen University City, Xili, Nanshan District as they make Shenzhen history! The bus leaves from Coco Park at 9:00am and costs just 20 RMB (includes a beer). UPDATE: On May 16th, 2015 the Shenzhen Dragons beat the Guangzhou Rams to become the new Rugby Champions of China!